The day began with a food assessment, wherein I dump all my food on the ground, pick some for today and the days remaining, and dump out anything extra. Today I didn’t dump anything. 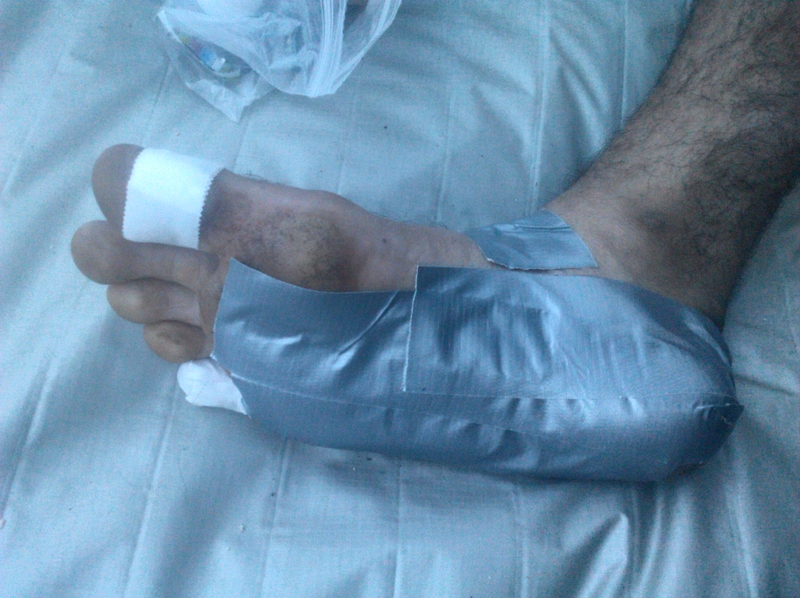 After that I taped my right foot in four different areas to combat four different problems. Today I’m trying out duck tape. By the time I crawled out of my tent, 9:00 a.m., the tent city from the night before had vanished. The trees glowed an eery yellow-green and dripped with dew. White fog laced with woodsmoke walled us in and I could see my breath. I didn’t bother to hide behind anything when I peed. I filled enough water for 3 hours from the water cache and crossed the road to head south. As I did I let out a “Whoop!” And the two guys that were there laughed. As I hiked I sneezed and coughed and spit and dripped mucous from every opening. Such is life when you are allergic to smoke. In sitting here and I’m afraid it might start raining again and I need to get to water but no, there can be no hurry. Armin van Buren is playing and I sit on these wet rocks with my pack still on and the fog gently glides across all my view and there, glowing an unmistakable warmth at some imperceivable distance I see Crater Lake for the first time. It is cool, my shoes are off and this is magical. Today I carried 17 miles of water. It was easy, I had extra. No problem. Tomorrow it’s 27. I’ll be at water soon and I’ll have to stop but this is one of those days that I don’t want to end. I spoke way too soon. The day’s last 4.5 miles from the Oregon-Washington highpoint to Thielson Creek dragged on well after dark in a cold fog that was so thick it that it somehow made seeing in the dark even more difficult. I had to make it to Thielson so that I’d be positioned to push through the 27 mile dry stretch tomorrow so I did, using my phone for light and finally setting up camp on a steep hillside. I’m too tired to care. This entry was posted in Pacific Crest Trail by Kyle. Bookmark the permalink.